Real power in Iran is in hands of Supreme Leader, Ayatollah Ali Khameni. TEHRAN, Iran (CNN) -- Ending weeks of speculation, former Iranian President Mohammad Khatami announced Sunday that he will run against the hardline incumbent, President Mahmoud Ahmadinejad, according to Iranian media reports. "I declare that I will stand for the next elections," Khatami told reporters on Sunday, according to Iran's state-run news agency, IRNA. Khatami, a leading reformist, had indicated for weeks he intended to run in the June elections. 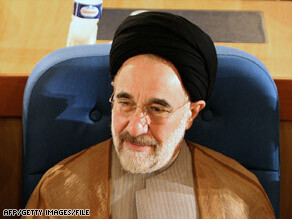 Khatami was under pressure from fellow reformists to announce his intentions regarding the upcoming election. He had said either he or former Iranian Prime Minister Mir Hossein Mousavi would run as the reformist candidate in June. Iranian fundamentalists who support Ahmadinejad for a second term accused the reformists of trying to buy time to consolidate their positions because they have no real candidate to match Ahmadinejad. Analysts say Khatami has the best chance out of any of the reformist candidates to unseat the current president. Khatami overwhelmingly won the presidency in 1997, raising hopes the reformist movement would bring religious and democratic freedoms to the Islamic republic. But the real power in Iran rests in the hands of the Supreme Leader, Ayatollah Ali Khameni. By the time Khatami left office in 2005, he was unable to make major changes due to the opposition of hardline elements in Iran's clerical establishment. In 2006, Khatami visited the United States, becoming the highest-ranking Iranian to visit the country since the 1979 revolution that brought the Islamic government to power. He has condemned terrorism and said he regretted the taking of American hostages by Iranian students in support of the revolution. Meanwhile, Ahmadinejad has been campaigning for re-election since Day One of his presidency in 2005. His frequent and well-publicized visits to Iran's provinces are part of an effort to reach out to the Iranian people. He has doled out financial aid to the poor in his dozens of visits across the country and recently more than doubled the salaries of government employees and retirees' pensions. Ahmadinejad has the support of Iran's Supreme Leader and the Islamic Revolution Guard Corps. Recently, a highly influential former Iranian Revolutionary Guard Corps commander indirectly but clearly offered his support for a second term for Ahmadinejad during a speech. But the downturn in the global economy -- particularly the falling price of oil -- could still hurt the incumbent president's chances for re-election and he may need a strong turnout at the polls to secure a victory.